Think Mardi Gras is all about the beads? Think again. When you go to the family-friendly parades, the booty ain’t on the pretty girls; it’s in your bags-full-of-crap that you wouldn’t want otherwise but suddenly find essential. Stuffed animals of varying sizes and mostly of poor quality–how they keep their stuffing in during all that partying is a mystery. Oh, and many are wearing Mardi Gras gear. Of course they are. A rubber chicken that I ABSOLUTELY HAD TO HAVE. I can’t explain why. I don’t like gag gifts, novelty items, or tradeshow giveaways. (That was my mom’s business and we had drawers full of thousands of misprinted pens (among other things). I hate imprinted items, but do thank them for sending me to college) But in the Mardi Gras moment–and even on the way home divvying up loot with my nieces, that chicken was mine. Then I gave it to a work friend who was truly baffled as to why I gave him such a thing. Probably the right reaction. Other treats: a parasol with tassels, which I (generously) let my nieces keep. Doubloons (coins) with the brand of each krewe (the crew of each float)–those are a treat. Or start a collection: a necklace from every parade with the krewe’s name. And of course there are the beads, which range from ordinary to huge and extravagant. Those are saved for women in the French Quarter or kids at the family parade. Good thing my nieces were there or I’d have left empty-handed. Seriously. Spending time with them, laughing and creating memories–feh. I needed them for the beads, people. Mardi Gras doesn’t always bring out the best in people: drunken debauchery for some; or for me, jealousy when someone caught what I was hoping for. It’s vicious, competitive, and absurd. And wonderful fun! Hello Louisiana! Anyone know what they throw in the French Quarter besides beads? A girl’s gotta know! 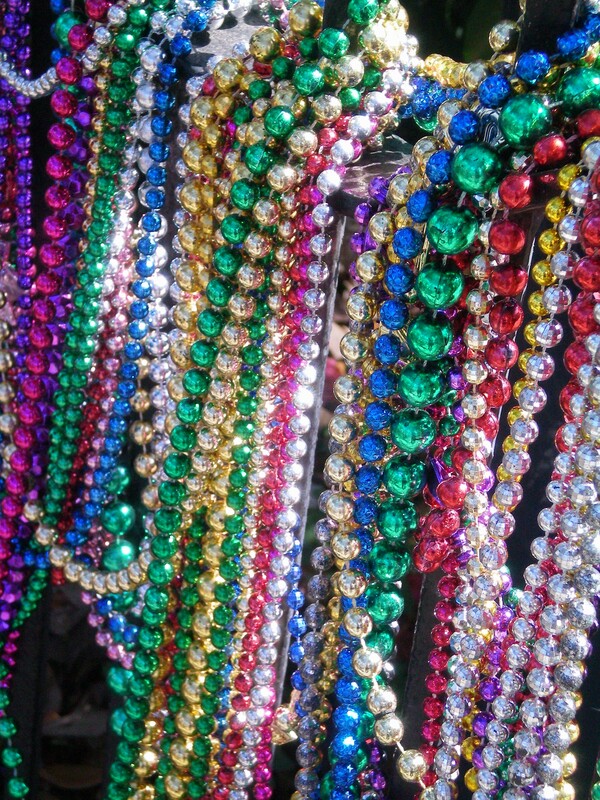 Although I love beads, not too crazy about the ones thrown at Mardi Gras. Great pics!